§6. Slave trade was an institution in Madras, and indeed, throughout Southern India. In most of the Hindu kingdoms of the Peninsula, the farm-labourers were slaves or serfs attached to the soil; they were probably aboriginal populations who had been reduced to slavery by their conquerors. Prisoners of war, male and female, were also compelled to serve the conquerors as domestic servants, and treated as slaves of the family. When Turks and Afghans introduced Mohammedan rule, slavery was recognised, but Hindu slaves might raise their condition by embracing Islam, and the converts might become important personages in the household, and marry female members of the family. The favourites of a grandee or Sultan might even marry a daughter, and rise to the rank of steward of the household or minister of state, like Joseph in the court of the Pharaohs. When the Moguls established their dominion over Northern India there was a change for the better. It was a fundamental law of the Moguls that no subject should be enslaved, but only captives taken in war. This law was still enforced when the Moguls became Mohammedans, for they always looked upon the slavery of subjects with horror, whatever might be their race or religion. Foreign slaves, male and female, provided they were not Mohammedans, were sold by private dealers, or in the public bazaar. Unfortunately, the Portuguese and other nations of Europe had not as yet awakened to the iniquity of slavery and the slave trade. During the Portuguese wars in Africa, Moors and Negroes were carried off as prisoners of war and sold as slaves in Lisbon. In India the Portuguese established depôts for the purchase of slaves. At Goa female slaves were to be found in every Portuguese household, and sometimes were sent into the streets to sell sweetmeats and confectionary, and earn money for their masters in other ways. For many years large numbers of Hindu slaves were brought from Bengal. The Portuguese had been permitted to build a factory at Hughly, on the river Hughly, about 120 miles from the sea. During an interval of civil war they fortified this settlement and landed numerous cannon, whilst a native town grew up in the neighbourhood. Meanwhile, the scum of Goa and other Portuguese towns, chiefly military deserters and apostate monks, had established themselves on the islands near the mouths of the Ganges, built a fleet of galleys, and led the lives of pirates, brigands, and kidnappers. These men were the pest of the Sunderbunds. They scoured the waterways of the delta of the Ganges, carried off whole villages into slavery, and especially delighted in capturing marriage processions, with the bride and bridegroom and all their kinsfolk and acquaintance in the bravery of silks and jewels. The Portuguese at Hughly were base enough to deal with these villains, to buy the poor wretches who had been kidnapped, and to ship them to Goa, where they were sold as slaves at the daily auctions on the Exchange, together with other commodities from all parts of the world. The rascally kidnappers at the mouths of the Ganges, and the pious traders at Hughly, alike quieted their consciences by baptising their victims, and boasting of having saved their souls from hell. Vengeance of the Great Mogul. Such a state of things aroused the Great Mogul to take action. The very existence of a Portuguese fortress and cannon within his dominions had given mortal offence, and this unholy slave trade sealed the fate of the Portuguese at Hughly. The settlement was environed by a Mogul army. There was a rush of ladies and children to the shipping, but the river was low and the vessels ran aground. There was absolutely no way of escape; all provisions were cut off, and the Portuguese were starved into surrender. Five or six hundred prisoners, many of noble birth, were sent to Agra. Some saved their lives by turning Mohammedans; others, mostly priests, perished as martyrs; the choicest of the lads and maidens were sent to the palace of the Great Mogul, and the remainder were distributed amongst the mansions of the Mohammedan grandees. For generations afterwards the doom of the Portuguese at Hughly was likened to the Babylonian captivity of the Hebrews. Hughly was captured in 1632. Seven years later the British built their factory at Madras, on the coast of Coromandel. At every Portuguese settlement in Southern India the slave trade was still in full swing, for the sway of the Great Mogul had only been extended over the northern part of the Deccan, and was as yet far away from the Peninsula. Accordingly the British traders at Madras connived at the exportation of slaves by sea. Some restraints, however, were placed upon kidnapping by insisting on the registration of every slave bought or sold in Madras, together with the names of the seller and purchaser, in order that the information might be given in the event of any inquiry by kinsfolk or acquaintance, and also that a fee might be levied on the registration of every slave. Great Mogul conquers the Deccan. In 1688 the British rulers of Madras abolished the slave trade by public proclamation. The Great Mogul, the once famous Aurangzeb, was engaged in conquering the Sultans of the Deccan. Unlike his predecessors, Aurangzeb was a bigoted Sunni, or a zealous believer in the four Caliphs who succeeded Mohammed. The Sultans of the Deccan were Shiahs who damned the first three Caliphs as usurpers, and swore that Ali, and Ali only, the son-in-law of the Prophet, the husband of Fatima and the father of Hassan and Hosein, was the rightful successor of Mohammed. Under such circumstances Aurangzeb was impelled by pious zeal for the interest of the Sunni religion to conquer and slay the heretic Sultans of the Deccan and annex their dominions to the Mogul empire. He next prepared to march his army further south into the Peninsula, with the view of conquering the Hindu Rajas and compelling their idolatrous subjects to accept the religion of the Koran. Stoppage of the slave trade. The British at Madras were greatly alarmed at the threatened approach of the Great Mogul. They were naturally afraid of sharing the fate of the Portuguese at Hughly. Accordingly they abolished the slave trade by proclamation, and sent numerous petitions to Aurangzeb, tendering their submission to the Great Mogul, praising his imperial majesty to the skies, imploring his protection as though he had been another Cyrus or Darius, and engaging to pay the old rent of 500l. per annum in pagodas. Matters were finally arranged, but it is grievous to add that the pious Aurangzeb was not so careful of the welfare of the Hindus as his liberal and tolerant predecessors. He preferred the laws of Mohammed to those of his Mogul ancestor, Chenghiz Khan; and within a few years the slave trade at Madras was as brisk as ever. §7. The Mogul conquest of the Sultans of the Deccan drove many Mohammedans to settle at Madras. The British traders protected the lives and property of Hindus and Mohammedans, and permitted them to worship as they pleased. In early days, the Directors had repeatedly pressed their servants at Madras to convert the Hindu worshippers of idols to the truths of Christianity, and no one in the British Isles seems to have doubted the possibility or expediency of the work. The British traders at Madras, however, deprecated any interference whatever. They described a terrible riot that broke out at St. Thomé because of some interference with a Hindu procession, and they urged that the frays between the Right and Left Hands were sufficient proof that it was best to leave the Hindus alone. As for Mohammedans, they were the subjects of the Great Mogul, and interference with the dominant religion in India was out of the question. During the latter years of the seventeenth century, the British settlement at Madras had grown into a principality, independent, and self-contained. At the same time it presented rare attractions to traders, Asiatic as well as European. The Company's servants were paid very small salaries, but were allowed the privilege of private trade in the eastern seas, so long as they paid customs and did not interfere with the European trade. Every Company's servant in Madras, from the Governor to the youngest writer, engaged more or less in trading ventures. The number of traders was swelled by private individuals who came from England, under the licence of the Court of Directors; as well as by Hindu, Mohammedan, and Armenian merchants, who often took shares with the Company's servants. 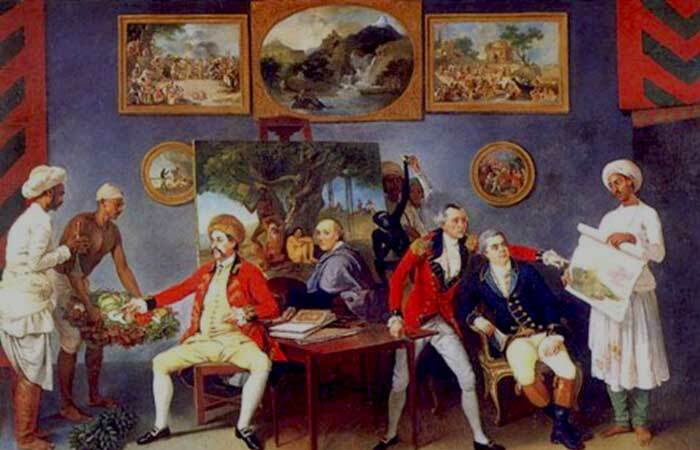 Moreover, this private trade increased the demand for European commodities which were sold by public auction in Fort St. George, and swelled the revenue of the East India Company which was derived from the sea customs. Meanwhile the British situation at the Mogul port of Surat had become intolerable. The religious fanaticism of Aurangzeb had stirred up hatred and discontent amongst Christians and Hindus. The factors at the English House were more oppressed than ever. On the north their trade was cut off by the Rajput princes of Western Hindustan, who were revolting against the Great Mogul and stopping the caravans between Surat and Agra. On the south they were exposed to the Mahrattas of the Western Deccan, who attacked and plundered Surat, and would have plundered the English House had not the factors surreptitiously landed some cannon, and called in the British sailors from the shipping, and manfully beaten off their assailants. Fortunately, the British had taken possession of the island of Bombay, which Charles the Second had obtained from the King of Portugal as part of the dowry of the Infanta Catharine, and made over to the East India Company. Bombay was nearly two hundred miles to the south of Surat, and hedged around by the Mahrattas, but being an island it was well protected, and included both a fortress and a town. Moreover, it had a magnificent harbour, and the valuable trade with the Persian Gulf, the Red Sea, and the Mozambique could be better carried on from this harbour than over the bar of Surat at the mouth of the river Tapty. Accordingly the East India Company secretly resolved on leaving Surat for ever, and removing the British factors and their trade to the island of Bombay. In Bengal the East India Company had established a factory at Hughly, hard by the dismantled Portuguese fortress; but were exposed to so much insolence and extortion from the Mogul authorities that they were prepared to leave Bengal rather than tamely submit to further oppression. The trade was enormously profitable, and had helped to defray the cost of the fortifications at Madras and Bombay. Saltpetre had been in large demand ever since the breaking out of the civil war between Charles the First and his parliament. Raw silk and opium were equally marketable, and all three products could be brought from Patna to Hughly by the river Ganges. At Dacca, the old capital of Bengal to the eastward of the Ganges, muslins were manufactured of so fine a texture that a piece sufficient for a dress might be passed through a wedding ring; and every young lady in the British Isles who aspired to be a bride was equally anxious to be led to the altar in a cloud of Dacca muslin. Aurangzeb, however, stopped the supply of saltpetre, because the Sultan of Turkey complained that it was used by Christians in their wars against true believers; whilst the Nawab of Bengal, who resided at Dacca, was most overbearing, and on one occasion ordered that Mr. Job Charnock, the chief of the Hughly factory, should be imprisoned and scourged, and his orders were literally obeyed by the Hughly officials. Plans of Sir Josiah Child, 1685. §8. Sir Josiah Child, the chairman of the Court of Directors, was endowed with real political genius, but he was imperious and headstrong. He resolved to make war upon the Great Mogul, and compel him to make reparation for the misdeeds of the Nawab of Bengal, and to cede sufficient territory for the establishment of a fortress and a town corresponding to the settlements at Madras and Bombay. He proposed to coerce the Great Mogul by sending out the Company's cruisers from Bombay to capture the Mogul ships going to Mecca, until Aurangzeb came to terms. He also persuaded James II. to send a Royal fleet to Bengal to ensure the success of his scheme. Should his plans fail, should Aurangzeb prove obstinate and impracticable, it was intended to form an alliance with the Raja of Arakan, on the eastern side of the Bay of Bengal, and promise to help him in his wars against the Great Mogul, provided he ceded the required territory at Chittagong. In short, Sir Josiah Child proposed to overawe the Mogul and establish British trade with India on a lasting basis for the future by means of three great fortresses—one at Madras, a second at Bombay, and a third in Bengal or at Chittagong. Unfortunately Sir Josiah Child was unable to cope with the craft and capacity of Aurangzeb. That keen-witted sovereign had spies in all directions, and was gifted with such a power of divining what was going on that he was often suspected of employing supernatural agency. Meanwhile, Sir Josiah Child was maintaining such profound secrecy that no Englishman on the Bengal side knew what was going on at Surat or Bombay, and no Englishman on the Bombay side knew what was going on in the Bay of Bengal, whilst the British at Madras knew nothing whatever of the plans in operation. The blundering that followed was most disastrous. Whilst the Company's cruisers were capturing Mogul ships as lawful prize, Aurangzeb drew the Surat factors into his clutches, and threatened to put them to death unless the prizes were restored and vast sums paid by way of ransom. Meanwhile, the Royal fleet arrived in Bengal, and made its way up the river Hughly, under the command of a certain Captain Heath, who would listen to no advice and regarded Asiatics with contempt, whilst he was ready to make war on anybody. He brought away Mr. Job Charnock and the British factors from Hughly, with all their goods and records. He captured all the Mogul ships he encountered in the Hughly river. He bombarded a Mogul town at the mouth of the river. Meanwhile, the Nawab of Bengal was in a panic of fear at Dacca, willing to make any terms provided only that the terrible admiral would leave Bengal and solemnly promise never to return. The Royal fleet sailed to Arakan and frightened the Raja into a state of utter bewilderment. The Raja could make nothing of the offer of the admiral to help him against the Great Mogul, nor of the demand for the cession of Chittagong, and he naturally vacillated, prevaricated, and procrastinated. The admiral was blind with rage and mortification, and would have captured Chittagong by force of arms; but the place was too strong for him. Accordingly, he sailed away to Madras in a towering fury, and landed Mr. Charnock and the British factors at Madras, swearing that he had heard nothing but deceit and lies since he first entered the Bay of Bengal. The East India Company submitted to the Great Mogul, but the great Josiah Child must have found it a bitter pill. The prizes were restored, a vast fine was paid, and pardon was humbly implored before the Surat factors were restored to liberty. Meanwhile, the Moguls had learned to respect the British. The fugitives from Hughly were invited to return to Bengal, and permitted to purchase a strip of land on the eastern bank of the Hughly river, about twenty miles nearer the sea than their old factory. It was three miles long and one mile inland, and included the three native villages of Chutanutti, Govindpore, and Kali Ghat, which grew into a native town resembling that of Madras. Later on, the Hindus round about revolted against Mogul oppression, and the British took advantage of the general alarm to convert their factory into a fortress and to give it the name of Fort William, in honour of the Prince of Orange. The native settlement was known by the name of Calcutta, after the village of Kali Ghat, or the "landing place of the goddess Kali." Thus the dream of Josiah Child was realised, and British trade in India was protected by three fortresses and three towns—Madras, Bombay, and Calcutta. From the end of the seventeenth century to the middle of the eighteenth the Company's settlements were for the most part shut out from the Indian world. The British had learned their lesson and kept quiet, and the Moguls were busy fighting the Mahrattas, and left them very much alone. The Mogul conquests in the Deccan were made over to a Mogul Viceroy known as the Nizam, whilst those in the eastern Peninsula round about Madras were placed in charge of a Nawab who was known as the Nawab of the Carnatic. Meanwhile, the Moguls kept the Mahrattas quiet by the payment of a yearly black-mail known as chout, or "chauth," which was reckoned at one-fourth of the land revenue, but was often commuted for a lump sum. Thus India was to all outward appearance in a state of calm, but it was the calm that precedes a storm. This was notoriously the case at Surat, where female slaves might be purchased by Europeans. There was a Dutch factory at Surat of the same stamp as the British factory, and its married inmates were in like manner forbidden to bring their wives from Holland. But when the Dutch got possession of Java, they offered grants of land to married Dutchmen, and, according to Pietro della Valle, there was a sudden change in domestic arrangements. Dutch bachelors were in such a hurry to go to Java, that they married Armenian Christians, or went off to the bazaar and bought female slaves and baptised them and married them without loss of time.